Makes SD/MMC flash memory card be a super compact, cost efficient, anti-shock, low power consumption, no acoustic noise and fast access time HDD. Enables IT engineers and embedded technology enthusiasts to use SD/MMC card as a normal IDE 2.5" hard disk. Provides an alternative for data storage and transfer or test for motherboard, sound/audio/memory card, etc. Ideal for some devices that required a fast and easy bootable device such as POS. 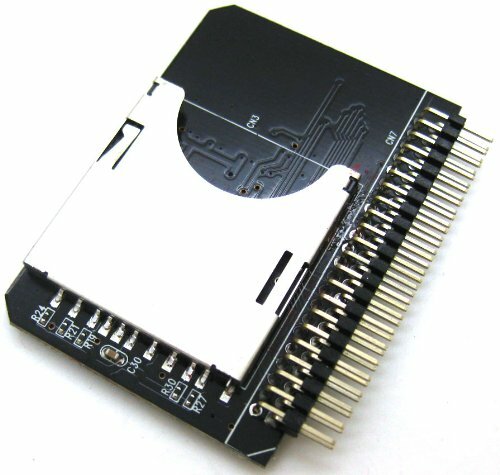 Be a SD/MMC card reader/writer.Compatible with SD, SDHC, SDXC & MMC specification.One 2.5" IDE hard disk driver 44pin male connector and one standard SD socket. Supports PIO, Multi-Word DMA and Ultra DMA data transfer mode.Supports boot function.No external power required and powered from IDE interface.Easy installation and no driver required.Mini board design and no space wasted.Dimensions: 36mm x 52mm.Attention: This adapter does not support hot-swap of CF cards, so please turn off power when changing cards. If you have any questions about this product by Optimal Shop, contact us by completing and submitting the form below. If you are looking for a specif part number, please include it with your message.